We currently offer three separate food programs to eligible Inyo & Mono county households. An intake application is required Annually for each program. These forms are used to collect necessary and required information that allows our agency to continue to serve. If you or your family are in need of Emergency Food Assistance, please visit our Food Pantry @ 137 East South Street, Bishop, CA 93514. Our office is open M-F from 9A-4P. For information regarding Food Pantry Donations, please download the Food Donation Guide below. For more information about donations, click the Food Donation Guide above. A Special Thanks to the University of California's, Agriculture and Natural Resources: Inyo-Mono Master Gardener Program. The volunteer's have spent countless hours supplying our food pantry with wonderful fresh produce. Agency volunteers distribute monthly Commodities in 13 communities throughout Inyo and Mono Counties. We distribute meats, vegetables, fruits, grains and dairy products to eligible residents of Inyo and Mono counties once per month at each distribution site. For a complete listing please download the Food Information Flyers above. IMACA has been working with the Food Bank of Northern Nevada to help fight hunger since 2011! Please see the Food Information Flyers above for the Monthly Mobile Harvest Donation near you! Applicant Sign-In Sheet (To be completed by HEAD Volunteer only). IMACA currently offers a Emergency food pantry for qualified residents in the following locations; Bishop, Darwin, Lone Pine, Mammoth Lakes & Lone Pine. 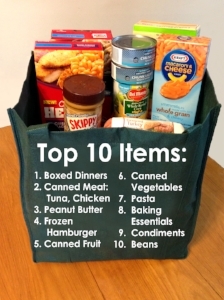 IMACA's Emergency Food Pantries can be visited (2) twice per month. Each location has different operating hours which can be found on the Food Information Flyers above.